We thank you for visiting Lama Kathy's webpage, and would like to encourage you to donate to our fundraiser aimed at helping Lama Kathy's dharma work. Since Lama Kathy completed her Three-Year Retreat in 1996, she has been traveling throughout North and South America teaching the Karma Kagyu dharma at the request of her teacher, Khenpo Karthar Rinpoche (pictured above). 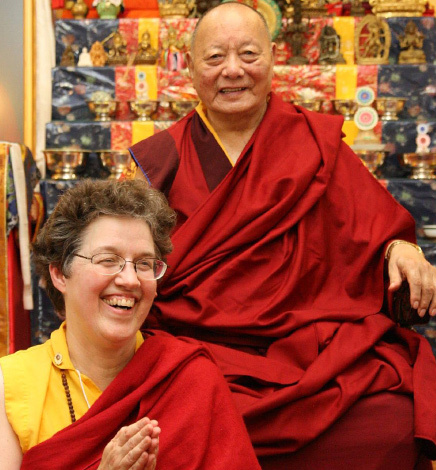 Following Khenpo Rinpoche's direction, Lama Kathy guides the spiritual program at her home center, the Columbus (Ohio) Karma Thegsum Choling, and in addition visits several other KTC-affiliated dharma centers each year. Besides this, Lama Kathy has been volunteering at His Holiness Karmapa's Karma Triyana Dharmachakra Monastery and looking after her husband Mike, who took disability retirement from the US Postal Service in 2008. Because Lama Kathy has devoted herself full-time to her dharma work, she relies on donations for her financial support. If you would like to donate toward Lama Kathy's dharma work, it would be greatly appreciated. Money donated through this fundraising page will benefit Lama Kathy's Medical Fund. This fund will help pay for health insurance and medical care for Lama Kathy and her husband Mike. Unfortunately, donations to this fundraiser for Lama Kathy's Medical Fund are not tax-deductible. However, all donations accompanied by a sender's name and postal address will be acknowledged by postal mail with a thank-you message. May all the merit generated by these activities be of benefit to all sentient beings. May all beings be freed from suffering, and come to awakening!